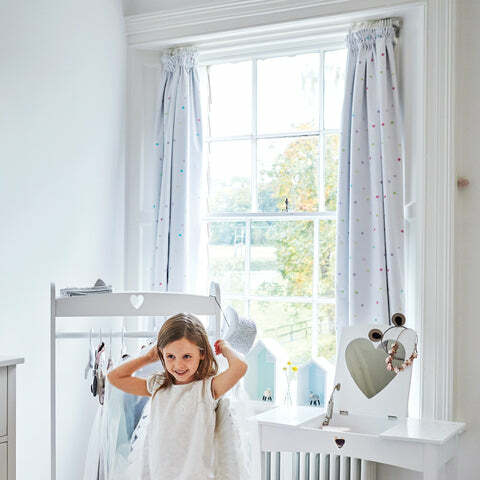 Children's Blackout Curtains - Confetti Spot, W165 x L137 cm | Great Little Trading Co. In need of a better night's sleep? These pretty curtains have blackout linings to stop daylight waking your children, which means earlier nights and later mornings for you and your family. The pencil pleat design means they can be used on either tracks or poles. Sold in pairs only. Available in two widths: Standard (two W135cm panels, for curtain poles W120 - 160cm) or Wide (two W165cm panels, for curtain poles W160 - 200cm). Available in two lengths: Standard (137cm/54 inches) or Long (183cm/72 inches). To ensure you order the right size, please refer to our Curtain Measuring Guide. You can request a Free Swatch to help you decide if these curtains are right for you. Don't forget there's also coordinating Children's Bedding, Wallpaper, and Rugs.